The inkling was for soup. It all started a few months ago when a friend asked if I made soup recently. She was looking for recipes because she was in a soup phase. Then she went on to tell me about a wonderful lentil soup she made. And so the seed was planted. I had lentil soup filed in my to-do list. Yet the road made a turn and I wound up making Lemony Couscous Lentil Salad. What caused the turn in the road? It was two things. One was the opportunity to use ingredients I had on hand. There was a partial box of Israeli couscous in the pantry and lovely Meyer lemons in the fridge. The other is because Sunday Supper announced a Winter Salad theme. I thought of lentils, couscous, vegetables, and a lemony dressing. Oh yea, that was it. One thing I needed was lentils. I also needed food, bully sticks, and toys for Milo. Well, food and bully sticks definitely. Puppies need to be fed and their chewing desire satisfied. We’ve seen the damage a puppy can do with chewing. Anyway, HomeGoods is two doors down from PetSmart. I thought I would see what toys they had. It was there where I spotted a bag of Umbrian lentils. It was my lucky day. Lentils come in many sizes and colors. They cook differently too. Some are better for soups while others are meant for sides or salads. One of those side or salad varieties is Umbrian Lentils (Amazon affiliate link). They are small, tan and brown, plus hold their shape well when cooked. You don’t want lentils to become mush when you are tossing them for a salad. The dressing really brightens the salad. It’s an easy one made in a blender. You can use either regular or Meyer lemons. The only difference is the dressing will have a greater tartness factor when using regular ones. You could balance it with adding a touch more honey. Lemony Couscous Lentil Salad is a hearty one. Lentils are packed with protein and fiber. I paired them with couscous so the salad would not be too heavy. Red onion and bell pepper bring crunch to the mix. Fresh thyme pairs so nicely with lemon so it had to be included. The salad goes beautifully with ham. What kind of salad do you eat in winter? I eat all different kinds. One I make often is Spinach Salad with Warm Bacon Dressing. Scroll down to see a whole bunch of ones made by Sunday Supper tastemakers. Also take a look at Black Lentils with Fresh Herbs and Yellow Lentil Soup with Vegetables for more lentil recipes. 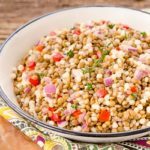 Lemony Couscous Lentil Salad has bell pepper, red onion, fresh thyme, and tossed with tangy lemon dressing. It goes splendidly with ham. Add lemon juice, garlic, shallot, lemon zest, mustard, honey, salt, and pepper to a blender. Blend until combined. With the blender on low, slowly pour in olive oil. Add 2 cups water and lentils to a medium saucepan. Bring to a fast simmer then reduce heat to low. Cook, loosely covered, until lentils are tender, about 20 minutes. Drain. Add 1 cup water and couscous to a small saucepan. Bring to a boil then reduce heat to low. Cover and cook until done, about 10 minutes (or as per package instructions). Drain if needed. 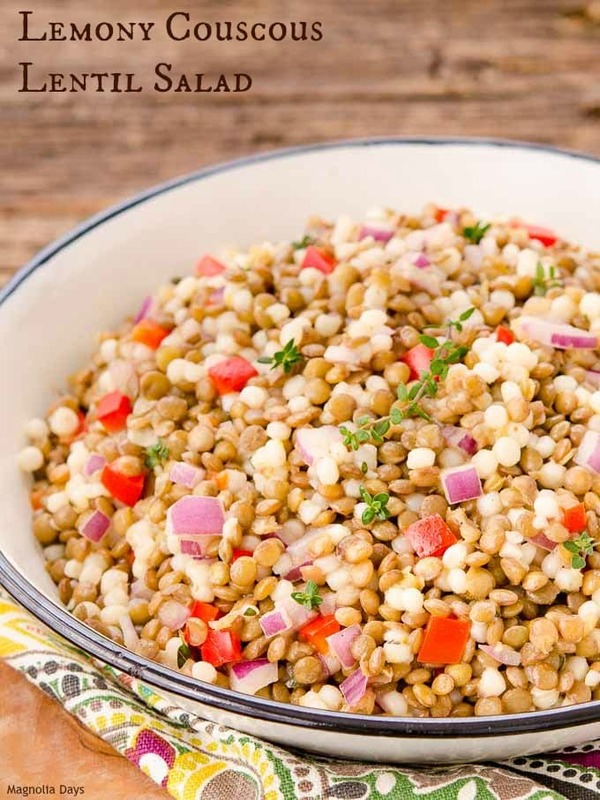 Add cooked lentils, couscous, and remaining salad ingredients to a large bowl. Toss to combine. Taste and add more dressing or seasonings as desired or to taste. Salad can be served immediately warm, at room temperature, or chilled for serving later. If chilled, allow to set at room temperature at least 30 minutes prior to serving. Store any remaining dressing in a sealed container in the refrigerator for a separate use. Bring to room temperature and shake to re-combine prior to using. This is my kind of salad, Renee! 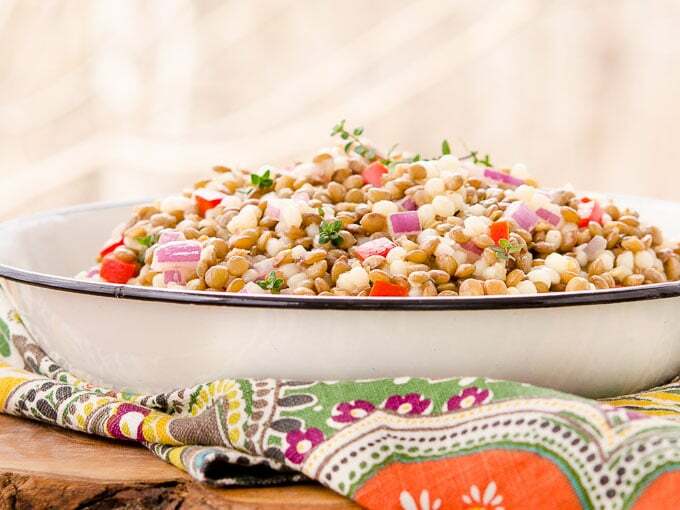 Bright lemony dressing and hearty lentils and couscous. Delicious! 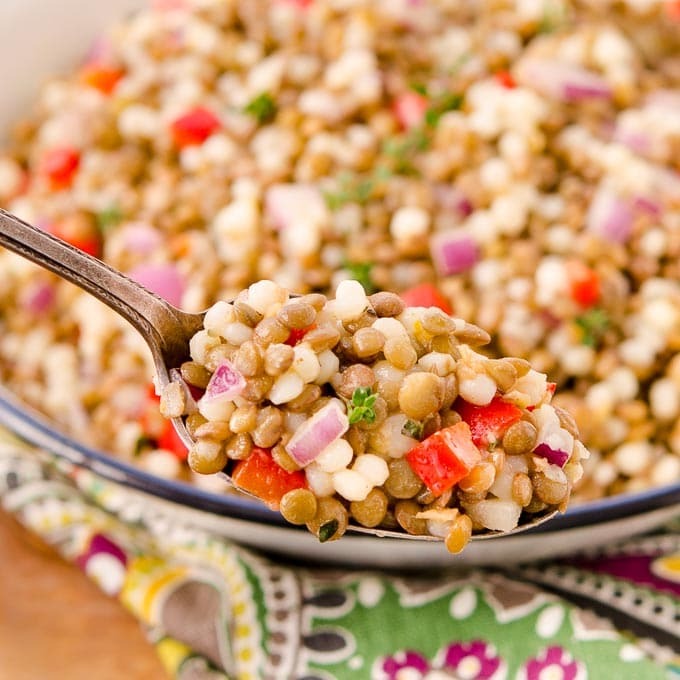 mmm, love the idea of this lentil salad. I bet the dressing really makes it work. Need to try! I love lemony dressings with both couscous and lentils but have never thought to combine them. Looks great! What a beautiful, nutritious salad. Lentils are so good for you and I love the lemony factor in the dressing to brighten it all up! Ohh now this is right up my alley! I love it!!! Hi Renee, I am a big salad eater, love this combination and your lemony dressing sounds wonderful. 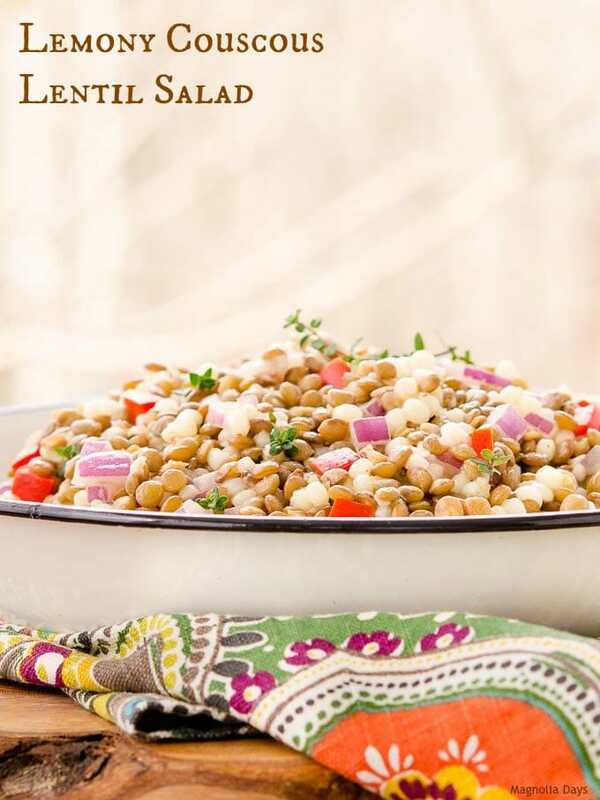 I love lentil soup so know your gorgeous salad would hit the spot, too! What a delicious meatless dinner! What a fabulous combo you have here for this salad. I NEED this in my life. I love the texture to this salad! Beautiful, Renee! Wonderful salad…My pups have tons and tons of toys and as soon as I thought there chewing business was over I bought a new couch…..Yep. they are eating the leather back right of of my couch. Aaargh. What a fun salad! I’m loving all of the different textures in there. Great alternative to bean salad. I just made this tonight! However I preferee It with equal parts of cous cous and lentils. I guess I’m not huge on lentils but LOVE cous cous!